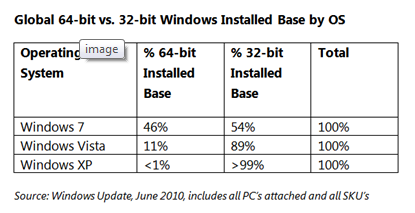 Compared to Windows Vista at 3 1/2 years after launch, only 11% of PCs running Windows Vista worldwide are running 64-bit. With Windows 7, running a 64-bit OS is becoming the norm! A primary benefit of 64-bit Windows is the increase in addressable memory. This makes more “bits” available to Windows (the OS), which means more information can be “addressed” at once. 32-bit architectures have a memory ceiling of 4GB while the 64-bit architecture increases the memory ceiling to approximately 17.2 billion GB or RAM! Windows 7 is designed to use up to 192 GB of RAM (see SKU and OS comparisons here), a huge jump compared to limits with all 32-bit systems. Moreover, the price of memory has dropped over the last several years making it easier for OEMs to up the amount of memory in the PCs they ship. Essentially, 64-bit Windows allows your PC to take advantage of more memory to do more things. Aside from the performance gains, there are also security enhancements and support for virtualization as well.